(Poetry Collection). Drunk on fame, an artist looks into his glass and finds no reflection. 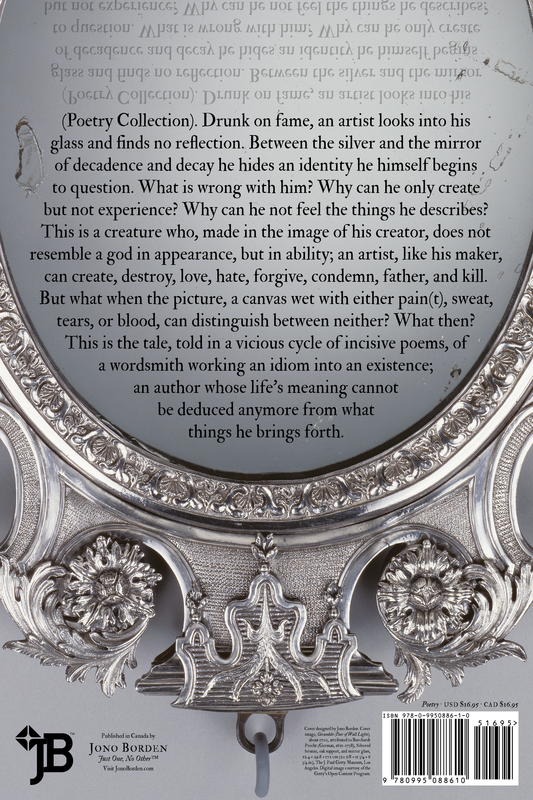 Between the silver and the mirror of decadence and decay he hides an identity he himself begins to question. What is wrong with him? Why can he only create but not experience? Why can he not feel the things he describes? This is a creature who, made in the image of his creator, does not resemble a god in appearance, but in ability; an artist, like his maker, can create, destroy, love, hate, forgive, condemn, father, and kill. But what when the picture, a canvas wet with either pain(t), sweat, tears, or blood, can distinguish between neither? What then? This is the tale, told in a vicious cycle of incisive poems, of a wordsmith working an idiom into an existence; an author whose life’s meaning cannot be deduced anymore from what things he brings forth.